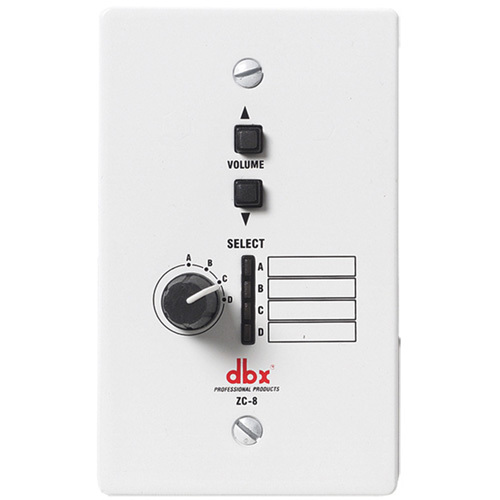 The dbx ZC 8 Series Audio Control Device shall provide both programmable push-button up/down volume control, and programmable rotary switch source selection for the dbx ZonePro devices. The remote device shall have DIP switches allowing identification with connection to the processing device via CAT 5 cable on RJ-45 connectors. The device shall be a dbx ZC-8 remote controller. CAT5 or CAT5E with 28.6 Ohm/M (Ohm/1000ft.) nominal DCR and rated VW-1 or higher.